…and that’s about all I’ve managed. After being tempted by the final film in my current LoveFilm trio this morning (Inception, and by the way, it was absolutely brilliant) I kept the telly on in the background while I sat down to tap-tap-tap away. That’s when all my good intentions flew out of the window. 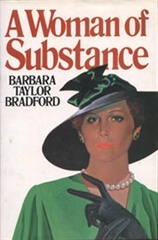 One of my favourite books as a teenager was Barbara Taylor-Bradford’s A Woman of Substance and guess what’s showing on the telly – the whole series from 1984, back to back. So I’ve climbed to the Top of the World (in the book this is Ramsden Crags on the Yorkshire Moors) and I’m just flitting about at the opening of the new Harte’s department store in Leeds. I can’t wait for the rest of the adventure to unfold…again! This entry was posted in cracking reads, Expat moments, Life in the UK, On The Box and tagged A Woman of Substance, Bank Holiday, Barbara Taylor-Bradford by Kym Hamer. Bookmark the permalink. I can't believe how young Liam Neeson is in it…or how hot Barry Bostwick used to be! I loved that series. Fab!